EXECUTIVE SUMMARY: Israel, Greece, and Cyprus are building a democratic bloc in the eastern Mediterranean. The Beersheba trilateral summit highlighted the strong momentum of this initiative, as well as American institutional support for it. Jerusalem, Athens, and Nicosia are expanding their collaboration in fields including defense, cyberspace, energy, and education. The potential construction of an East Med pipeline could be a flagship project contributing to security and prosperity in Europe and the Middle East. 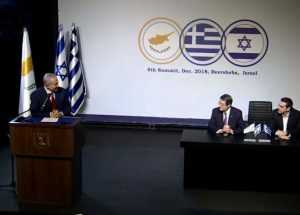 Israel, Greece, and Cyprus are steadily strengthening their partnership in the eastern Mediterranean, with institutional dialogue organized in the form of tripartite summits. Five such meetings have already taken place – the most recent in Beersheba – and the sixth will be held in February 2019 on the island of Crete. In Beersheba, PMs Benjamin Netanyahu and Alexis Tsipras and President Nicos Anastasiades agreed to establish a permanent secretariat to be based in Nicosia. The three countries will also collaborate, inter alia, on cybersecurity, smart cities, innovation with emphasis on supporting young entrepreneurs, education, environmental protection, research on agriculture, meteorology, health, and tourism. On the economic front, the Beersheba summit was preceded by the first trilateral business forum, which took place in Tel Aviv. Relevant chambers of commerce are expected to further engage the business communities of the three countries. The potential here is enormous. Israeli foreign direct investments in Greece, for instance, remain relatively low, amounting to €26.7 million in 2016 and €32 million in 2017. But the ongoing interest of Israeli companies in the real estate sector, hotels, and the food industry in Greece can lead to an increase in the future. Similarly, some Greek companies are seeking to increase their exports to Israel or invest in the energy sector. Recently, for example, Energean Oil & Gas announced the signing of a memorandum of understanding with Israel Natural Gas Lines regarding constructing and transferring the onshore and near shore part of natural gas facilities for the Karish and Tanin developments. The process has not always been harmonious. Turkish policy in the eastern Mediterranean is creating obstacles. In the Beersheba summit statement, Netanyahu, Tsipras, and Anastasiades reiterated their full support and solidarity with Cyprus in exercising its sovereign rights in its exclusive economic zone. Until now, Washington has preferred to publicly adopt a stance of equal distance between Athens/Nicosia and Ankara. A recent interview with US Assistant Secretary of State for European and Eurasian Affairs Wess Mitchell might, however, signal the beginning of a change in that approach. Talking to the Kathimerini newspaper, Mitchell encouraged Cyprus to develop its resources, characterized Turkey’s view as “a minority of one versus the rest of the world,” and expressed his country’s opposition to any kind of harassment in Cypriot waters. While this message is important, it remains to be seen how Washington will react in the blocs of the Cypriot exclusive economic zone where US ships are not involved in drilling. The construction of the East Med pipeline with America’s blessing would benefit the democratic bloc of Israel, Greece, and Cyprus and cancel plans for the transportation of natural gas from the Levantine Basin to Europe via Turkey. The US may well wish to warn or even punish Turkey for its expansion of its military cooperation with Russia (for example, Ankara’s deal with Moscow for the supply of S-400 missiles). But while the bilateral relationship with Turkey is vexing, Washington still counts on it. The Department of State recently notified Congress of a proposal to sell the Patriot air and missile defense system to Ankara, which might be an attempt to halt the S-400 purchase. More importantly, the withdrawal of American troops from Syria means better coordination will now be required between Washington and Ankara. According to media reports, Trump has accepted an invitation from Erdoğan to visit Ankara in 2019. While Washington is endeavoring to find a modus vivendi with Ankara, it still values its allies in the eastern Mediterranean and southeastern Europe. The fundamental strength of American-Israeli relations is largely taken for granted, and this is slowly becoming true for American-Cypriot-relations and American-Greek relations as well. Russia is a catalyst in that process. The US and Cyprus are improving their bilateral relationship, a step Moscow is not prepared to handle. In November 2018, Washington and Nicosia signed a statement of intent on security affairs, prompting Moscow to react fiercely against what it sees as a US plan to militarize Cyprus. And in December 2018, the inaugural strategic dialogue between the US and Greece was launched. Among other things, Greece is supporting the enlargement of NATO in the Balkans, as the Prespes Agreement paves the way for the former Yugoslav Republic of Macedonia to join it. Moscow made very clear that it objects to the deal reached between the governments of Athens and Skopje (FYROM) last June. While the Israeli-Greek-Cypriot institutionalized dialogue is yielding initial results and creating a strong basis for cooperation in the long term, further grassroots mobilization is necessary. Unacceptable acts such as the frequent vandalism of the Thessaloniki Holocaust Memorial do not align with Israel’s improving image in Greece and Cyprus and are a warning signal. A nexus of collaboration between the communities of the three countries – with the participation of representatives of several sectors, including media and culture – will certainly contribute to better understanding. The respective diaspora communities, as the Beersheba summit statement illustrated, will provide more assistance and depth.